The sun was just above the horizon when we spotted a massive flock of birds in the distance. 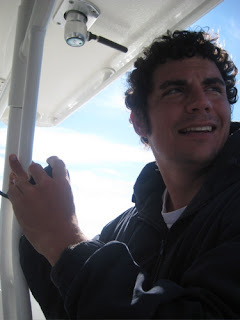 Captain Lane quickly put us on an intercept course while the rest of the crew readied the squid bars and outriggers. It was early, but there was already action on the water. Sure enough, as we neared the birds, there were tuna feeding. 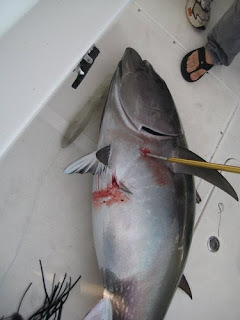 We dropped our lines in the water and pushed through the tuna. Our hopes for an early-morning hookup (standard operation procedure after a late-night solid hookup) went unmet. Bird activity in the area was high, so we spent the next few hours chasing flocks with no luck. Many Finbacks were working the area as well. At one point a large whale surfaced five meters along the port side of the vessel. Aha! 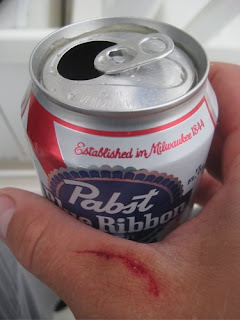 I realized our folly and promptly reached in the cooler and pulled out a cold PBR. Poseidon be laughing at us, says I.
I cracked the can and poured a bit over the side, hoping that Poseidon was as thirsty as I was. The rest of the crew must have seen the enjoyment on my face, for a short while later they asked for brews of their own. Fully equipped, we sat back and waited. There were five of us on board. Captain Lane, his friend Mike from work, Wilkie, my friend Micah from school, and myself. This strategy proved successful, for two beers later, one of the flat lines went off. Mike, one of Keith's co-workers was harnessed to the Tiagra and began to battle the beast. Wilkie grabbed the gaff and assumed his kill stance. 20 minutes later, the fish was alongside the Edgewater. 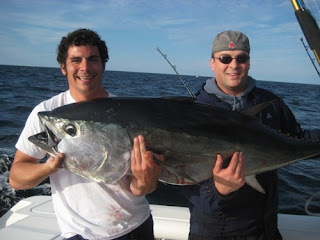 Micah, this being his first time out tuna fishing and an Alabama native was dumfounded at the 60.5” torpedo as we hauled it over the gunwale. “Man. When you said we were going tuna fishing, I was thinking maybe a 20-30 pound fish. I had no idea it was going to be that big!" 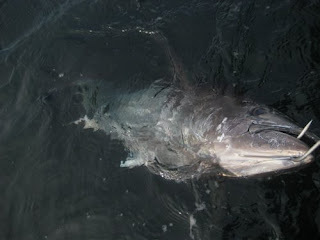 With the 135 lb beast on board, we shot some pictures and processed the fish. Victory had been achieved, so we settled into a much more relaxed fishing mode. As the sun rose higher off the horizon, a strange thing happened. For a few hours, everything got real hazy - almost as if a fog descended on the boat. It was funny though, because the seas were calm and there wasn't a cloud in the sky. No one was really paying attention to our course. Wilkie was sitting in the co-pilot seat with the captain standing to the right of him. "What kind of course do you have us on there, Wilkie?" The Captain asked. Wilkie obviously wasn't driving – no one was. But did it matter? No. We were in the middle of the open seas. There may have been a boat or two on the horizon but nothing of consequence. Just a group of men and their conversation enjoying the late-summer morning. It was during this period of calm when one of the rods got hit again. I was sitting on the bow with Wilkie, having an in-depth conversation comparing our respective footwear when I saw another one of the flat line rods bend over. Immediately the boat was thrown into mayhem. 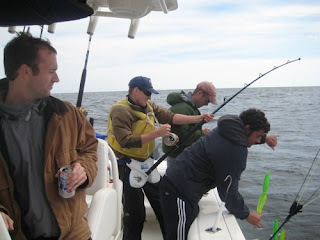 I got strapped into the life jacket and rod, and began to do battle with my first tuna. Unfortunately the rod bottom was broken, meaning that the plastic slot that fits into the rod harness allowed the rod to freely swivel (the 4 am epoxy fix Lane attempted obviously didn’t work). This problem quickly became apparent because whenever I tried to reel, the rod would twist - thereby negating almost all of the motion. Wilkie had to do his best to try and stabilize and prevent the rod from twisting as I reeled. Not an easy task with minimal leverage – but our combined effort seemed to be working. A good 20-30 minute battle ensued before the fish was finally brought alongside the boat. It was still feisty, and was giving the de-hooking crew of Wilkie and Lane some problems. At one point it made a run and almost pulled me into the drink. But Wilkie and Lane were able to slip a small gaff under it’s lip before removing the hook and reviving the fish before sending it back down to the depths. This one was a bit smaller than the first – a bit skinnier and a few inches shorter. We estimated its mass at 115 lbs. Two nice fish and a gorgeous day were more than we could have asked for, but upon surveying the western horizon, it appeared that a low pressure front was moving in our direction. It was looking more and more ominous, so we pulled the lines, threw in a CD of disco-funk I had brought, and headed back to the ranch. The seas picked up quick, and pretty soon rogue waves were drenching us. Poseidon wasn’t done with us yet. It wasn’t too pleasant a trip back – but the Edgewater rode dirty and got us home without too much pain; a much more comfortable ride compared to the days when we used to take the 18’ Whaler out in similar seas. Back at the dock, we cleaned up the fish, made some breakfast, and passed out. Another victory on the eastern seaboard. neil, a pleasure to read. i have had similar changes in fishing luck due to the opening of cans and/or tins. 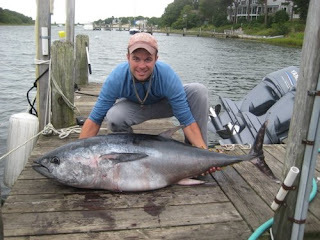 i trust the mighty tuna provided a meal worthy of its battle. keith, i like your curls. Nice post Neil. Another solid hook up. Jesse, I had em long but I cut em last week. No 13 bananas on board guys??? Cmon. Well told Neil, fantastic story. I am continuously amazed by the sheer numbers of pelagics off of Mass.